Sales of comic books and trade paperbacks to comics shops increased 9% in the first half of 2005 to $168.4 million, according to my analysis of sales reports released by Diamond Comic Distributors on July 21. June's double-digit percentage sales increase helped push the first half of 2005 toward solid gains. This bodes well for a continuation of the recovery in comics that began in July 2000. Click to see the sales estimates for June 2005. Comics unit sales: Led by House of M #1 and 2, the Top 300 comic books had retailer orders of 7.08 million copies in June, 8% more than June 2004, which also had five shipping weeks. Having the same number of shipping weeks in months in consecutive years helps comparison. While some say that publishers spread out their schedules to balance the number of titles in each month, it's one more week for late (or early) titles from other months to wind up in. Year-to-year comparisons are cleanest, when it's four weeks versus four weeks or five versus five. New publishers posting in the Top 300 included APComics, with Mr. T #1, and Silent Devil, with Dracula vs. King Arthur #1. Comics dollar sales: The Top 300 comic books had sales worth $20.83 million in June, 11% more than June 2004. For the half-year, the Top 300 comics from each month have sold a combined $104.8 million, a 2% increase over the same half-year period. Trade paperbacks : The Top 100 trade paperbacks and graphic novels reported by Diamond had orders worth $3.79 million at full retail in June. Adding those to the Top 300 comics for the month yields $24.62 million, an increase of 11% over June 2004. For the half-year, the Top 300 comics and the Top 100 trade paperbacks from each month had orders worth $127.31 million, an increase of 5.5% over the same six months in 2004. Diamond's overall sales: Diamond publishes dollar market shares for its top 20 publishers across all comics, trade paperbacks, and magazines. Knowing the exact total orders of any publisher on that list right down to the oldest backlist item allows you to calculate Diamond's total orders across these product groups. The June 2005 total was $32.83 million, which increases to $35.73 million, when Diamond's United Kingdom orders are added. The figure is up 11% over June 2005. Overall, the last six months stand at $168.44 million, as mentioned above: up nearly 9%. This largest category continues to show faster growth than the more narrow ones, suggesting that an ever-increasing amount of business is being generated by the thousands of backlist trade paperbacks that do not make Diamond's Top 100 list each month. The overall category overstates comics' actual performance to the extent that magazines that do not have comics content are included. The comics publishers market shares would actually be slightly higher if you could knock out some of the ancillary items. Market shares: Marvel led DC in Diamond's reported overall unit and dollar market shares, and that held true for each of the narrower calculations. DC had 98 comics in the Top 300 versus Marvel's 86; Image posted a strong month with 35 titles making the list. Dark Horse's strength continues to be in its backlist, coming in third in Diamond's overall dollar list despite having only 13 comics in the Top 300, just one more than IDW. Price analysis: The average comic book on Diamond's Top 300 list cost $3.15, up from $3.06 in June 2004. The weighted average price — that is, the cost of the average comic book Diamond sold — was $2.94, up from $2.83 last year. 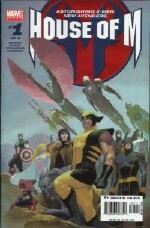 The average price of the comics that made the Top 25 was $2.60, however, down two cents from June 2004.